Two weeks ago, 19-year-old super-genius Amadeus Cho suffered a painful loss, one that shocked readers in a big way. But, when you’re the newest Green Goliath in the Marvel Universe, it means you don’t get to be angry and upset without every other hero watching you suspiciously. It’s primarily understood as sad emotion, but grief is often bound up with anger and frustration, too. In the past, those feelings have been triggers that caused Bruce Banner to change into the Hulk. But Banner is dead now, controversially killed by fellow Avenger Hawkeye after a vision predicted he’d go on a murderous rampage. Completely free of gamma radiation, Banner had attained a new level of inner peace in his life. This week’s Totally Awesome Hulk #9—written by Greg Pak, with art by Mike Del Mundo, Marco D’Alfonso and Cory Petit— shows how Amadeus is dealing with the aftermath of Banner’s death. When Amadeus Cho’s tenure as the Totally Awesome Hulk started, the core conceit was that he wasn’t a gamma-powered rage-beast. He was snarkier, more hormonal and smarter than the most common iteration of his predecessor. Thinking that Banner’s unjust death could be the thing that makes Amadeus go to a darker, more violent place, Captain Marvel pays him a visit with a lot of back up. Going back several years to storylines like Planet Hulk and World War Hulk, Pak’s run on the Hulk has been about emotions and how humans process them. Where previous storylines dealt with the rejection of being an outcast and the acceptance found in creating a different sort of family, Amadeus Cho’s stories so far are weaving together as a coming-of-age saga. Cho is seemingly more well-adjusted than Banner was but he’s still a young man figuring out his place in the world. That’s exponentially more difficult when the world wants to put you in one category and you think you belong somewhere else. His sharp responses and foreboding exchanges in this issue are signs that The Cho Hulk isn’t devoid of anger. It’s just a different kind of mad, one that will take him into different conflicts and psychological spaces. 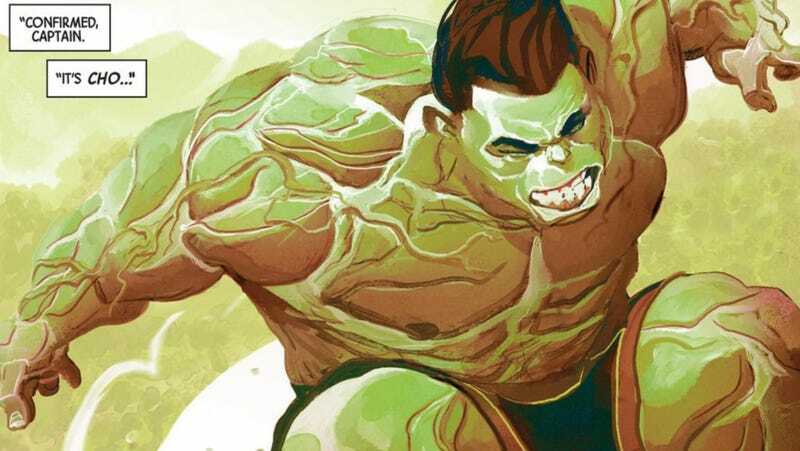 This Hulk won’t necessarily go tearing up buildings when he’s in a bad mood, but it’s entirely likely that he’ll still cause another sort of damage. Given the fractious state of the ethics debate in the Marvel Universe—where heroes are debating over whether to stop potential crimes that might happen—any chaos he might cause could be a very good thing.